Ready for something different this week? Bell Custom Guitars offers some unique style points; blending wood & plexiglass into familiar yet edgy shapes. 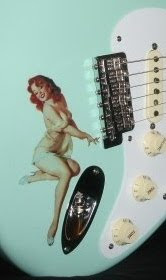 Diggin' that headstock! I haven't a clue about how these might sound. Body woods are usually maple, as in case of this CTS Phantom model. Hardware looks to be top end, and pickups are exclusively by Amalfitano. Jerry Amalfitano of Keller, Texas builds all his pickups by hand. 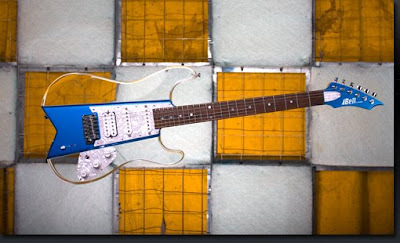 Don Bell does custom guitars for various solidbody needs, but also offers a standard line up including a couple S-type shapes, a V shape and a very sporty looking J-type called the Jazzblaster Deluxe. Premier Guitars has more info. on the entire Bell line.